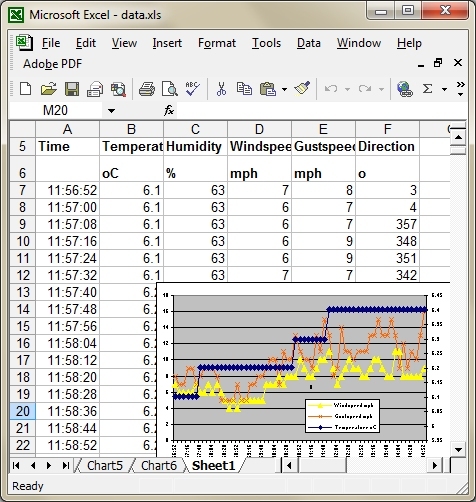 Easy data logging and control with Excel. Collect readings from sensors and instruments over USB, Internet, Ethernet, Modbus, RS485, RS422, RS232 and TCP-IP. Control devices and output channels from Excel. Automatically act on alarms. Windmill's new software, called Real Time Data Server, gives Excel many data acquisition and control powers. Compatible with 32-bit versions of Excel on 32-bit Windows operating systems. Not compatible with 64-bit versions of Microsoft Office. Being able to set differing rates of reading and updating data is useful, for example, when you want to show average readings over time. So Excel may be receiving readings every minute and updating its average calculation every 5 minutes. Once installed, you simply enter a formula into an Excel cell, or a line into your Excel macros and VBA programs, and Excel will start collecting data. What Instruments can be Connected to Excel? With the Windmill Real Time Data Server and the appropriate driver, Excel can log data from thermocouples, GPS receivers, plcs, particle analysers, strain guages, sonar, RFID readers, gas analysers, RTDs, oxygen electrodes, gyro compasses, pressure sensors, pH transmitters and digital thermometers. With the COMIML driver, you can connect almost any instrument communicating over RS232, RS485, RS422, Modbus, Ethernet, Internet and TCP-IP. Other drivers are available, for example the Microlink USB and Ethernet drivers, and the Harvester DDE Server. You can mix and match equipment from many different manufacturers in many combinations. For example, devices from Bruël & Kjær, Garmin, Funaro, Magellan, Motorola, Omron, Sartorius, Siemens and Texas Instruments can all be interfaced to Excel. Many channels of data can be accepted from each instrument. The Windmill Real Time Data Server software for Excel is free to existing users of Enhanced Windmill. Otherwise it costs £100 together with the Standard Windmill instrument drivers and hardware setup software. If you already have Standard Windmill, the Excel data logger software costs just £50. For more information contact [email protected]. To buy on-line go to our data acquisition catalogue. Windmill Software is a British company established 1991. They specialise in data acquisition and control systems using Windows software.